Ani DiFranco’s “Gravel” burst from my iPod headphones as I left the house this morning and transported me back to another place and time in my life. It was 1997, and I was a new Ani DiFranco fan. After borrowing her tapes from my friends Andrea and Nava (yes: TAPES) I snapped up two of her remarkable trio of perfect LPs, Out of Range and Dilate, and waited with bated breath for April 22nd. That was when her new, live, double-CD Living in Clip would be released. 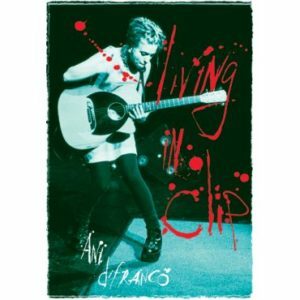 Living in Clip contained a bevy of older songs that were new to me, but one that no one had ever heard before outside of concerts: “Gravel.” It was the third track. How did she make those sounds? I had plenty of friends who played guitar, but none of them made the sounds that came out of “Gravel.” The guitar hopped and skipped, and sometimes barked. How did she do it? I played that record into the ground in 1997 – played it so much that both my mother and I had it memorized from front to back. We saw Ani together for the first time that summer, sitting in the rafters of The Mann Music Center, watching her open for Bob Dylan. “Gravel” also had a more immediate effect. Less than six weeks after I first heard it I begged my mother to buy me an acoustic guitar. I think she was surprised by my sudden vehemence – while I certainly asked for things, they were usually music or books. I didn’t frequently beg for anything, aside from the ability to get online – and I quickly became a whiz at that. She relented and bought me a guitar. Who knows what she thought I would do with it, but the night we brought it home I learned to play “Dilate” from a guitar tab (a what? ), and started to slowly decipher the tab for “Gravel.” By the end of the summer I could play the song all the way through. That’s where “Gravel” took my brain this morning – fifteen years ago, almost to the week. Half my life – a half completely changed because of my fascination with this single, amazing song.